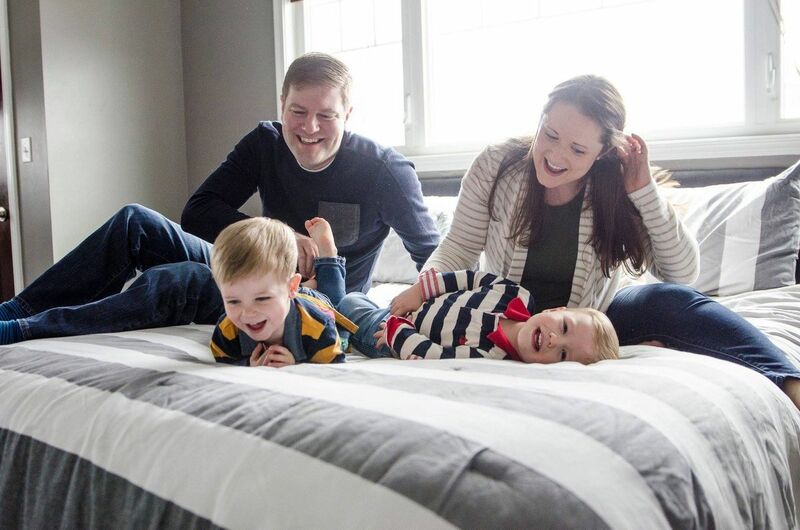 Tell us about who is in your family: My husband Noah and I have twin boys, Graham & Logan, who turned two in February. Current/Previous career: I work full time at an advertising agency in the city. But my job allows me the flexibility to work from home twice a week, which has really made it possible for me to balance it all. What was your childhood ambition? I wanted to be an artist. Funny because I’m not very artistically inclined. It was the eighties, so I think I thought it meant I got to wear a cool beret. What does motherhood mean to you? Motherhood means having your own personal source of joy, humor, awe, worry, frustration and stress all in one tiny human (or two). One minute I’m belly laughing as their personalities are emerging, and the next I’m wrestling someone into a diaper and we’re both in tears. Motherhood tests your limits of both love and patience. You learn how far you can stretch both. And on the days when I feel I don’t have enough of either, I’m learning to give myself some grace. How did you find FIT4MOM? While I was on maternity leave I was searching for fun ways to lose the baby weight. I first read about F4M on a blog, Lucie’s List. Then I searched to see if there was one near me and the rest is history! I started with SS before I went back to work (I may have also taken a day off work right after I went back just so I could go to the Cantigny class). Two years later, I just completed my 5th full Body Back session and I’m already looking forward to #6 in the fall. How has FIT4MOM changed your life? How hasn’t it?! I don’t want to imagine what life would be like without this village and am thankful I found it at exactly the right moment. This group not only helped me lose the baby weight, but it has made me stronger - physically and mentally, has given me something to be passionate about, has given me a new outlook on health and fitness, and has introduced me to some of the greatest women who are both friends AND Mommy support. Not to mention all the product and service recos. ;) Thank you F4M Dupage County!! Favorite exercise: I adore Tabata workouts. Something about those 20 seconds that makes me feel super strong. Favorite individual move might be burpees (shocking, I know!). Not because I enjoy doing them, but because they are an exercise that I have gotten so much better at compared to when I first started and that physical progress is what I love about this group. I’m a mom of twin toddlers and I can do 100 pretty-close-to-proper burpees in a single class. If that doesn’t make you feel like superwoman, not sure what does. Proudest moment: I shared this recently during a BB question of the day, but soon after I went back to work and had officially become a “working parent,” I earned an important promotion. Which meant that not only was I surviving, but I was actually thriving. Any time I second guess myself or my decision to keep working (almost daily - ha! ), I think about that moment and it reenergizes me. It’s never pretty, but somehow my husband and I manage to keep both our work families and real families afloat and that makes me pretty proud. Tell us something about yourself that would surprise us: For a brief period in 3rd grade, I was a synchronized swimmer. Didn’t quite have the grace - or core strength - to make it big, but to this day I still love to watch it during the summer Olympics and wonder if it could have been me.